Aboriginal traditional music is made up mainly of rhythmic singing supported by a small number of instruments. Aboriginals used handclaps, body slapping, boomerangs and clap sticks to produce definite beats. In Aboriginal culture, the most important non-percussive instrument is the didjeridu (a long, hollow piece of wood which produces a low, melodic tone when played as a wind instrument) and on the northern coastal regions large conch shells were used to produce sounds. There were no traditional stringed instruments. Music and dance were a continual part of the Australian Aboriginal life. They were used not only for ceremonies, but also for telling stories about everyday happenings and events. 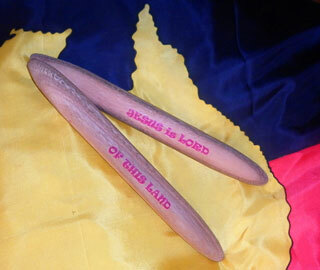 OOOMB have produced these clap sticks at the request of Australian Aboriginal elders in Northern Territory. Aboriginal Christians raised concerns about using traditional clap sticks in worship services as there was uncertainty over who produced them and to which spirits they may have been dedicated. 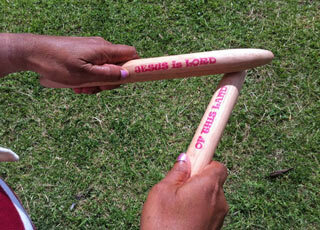 Out of Our Minds Banners have specifically produced these clap sticks to be spiritually clean. They have been dedicated to the Lord God of Israel. No matter where you are in the world, each time they are struck they loudly proclaim “Jesus is Lord of this Land”! Our clapsticks are crafted from Australian Spotted Gum which grows in the coastal districts of eastern Australia. This is a very hard wood (rated one on a scale of six) which is resistant to indentation and gives off a clear clap tone when struck. Each pair of clapsticks is unique in colour with the timber ranging in hue from a light to dark brown. The clapsticks have been turned with rounded ends and produce a strong, deep sound when struck against each other. 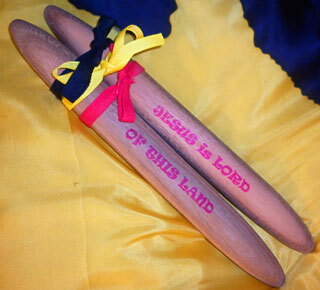 The words “Jesus is Lord” and “Of This Land” are printed on each pair which are finished with an oil polish. OOOMB’s clapsticks are 30cm (12 Inches) long and are available in two diameters: 32mm (1.3 Inch) and 25mm (1 Inch). OOOMB’s clapsticks are long and easy to use. One stick is held in each hand and they are struck together around the mid-point of each. Different tones can be produced by simply striking the wood at different angles to each other. The narrow ends ensure the vibration of each tap has a high-frequency, which stands out well above the noise of other traditional instruments. Use them as percussion instruments in worship or intercessory settings. They are a perfect for tapping out a clear beat while proclaiming Jesus’ authority over every area. As in most cultures, the Australian Aboriginals used percussive instruments in their ceremonies. Clapsticks, also referred to as “music sticks” were used to keep rhythm in traditional dance and song. They were made from timber found in the local area and were often traded for different types of wood not found in the same area. Sometimes they were painted or burnt but also often left plain. Today, Aboriginal clapsticks are used all over the world as an ancient percussion instrument. We offer FREE postage for four or more pairs in Australia and three or more pairs to any other nation. After adding an item to your basket, you can alter the number you want, or remove it. Currency note: Online payments are processed in Australian Dollars The "Display Currency" menu above provides an approximate value of your order in other currencies and is based on recent exchange rates. For customers outside of Australia, your Credit Card provider will convert the purchase amount in AUD into your currency using the relevant exchange rate applying at the time of their processing. This means the transaction amount seen on your statement may be different to the estimate indicated here. Lift up a banner in the land!